A 0.500-kg mass suspended from a spring oscillates with a period of 1.50 s. How much mass must be added to the object to change the period to 2.00 s? This is College Physics Answers with Shaun Dychko. The period of a simple harmonic oscillator is two Pi times the square root of mass divided by the spring constant. Now we have the period in the first case is two Pi square root m one over k. And then in the second case after some mass is added that's delta m. It's going to be two Pi times square root of the original mass plus the amount that gets added divided by k. And our job here is to solve for delta m. So we'll take period two which we know is two seconds, divided by period one which is one and a half seconds. And it's going to equal two Pi times square root m1 plus delta m over k. And then instead of dividing by this fraction, I'm going to multiply it by its reciprocal. So when dividing by T1, we're going to write instead multiplied by one over two Pi times square root k over m1. That's the reciprocal of this. I'm writing it that way makes it easy to see that the two Pi is cancel and the square root k is cancel. And this gives T2 over T1 is square root of m1 plus delta m over m1. Then we square both sides to get rid of the square root sign and we have T2 over T1 squared equals m1 plus delta m over m1. And then we'll multiply both sides by m1 then switch the sides around so the unknown is on the left. And we have m1 plus delta m equals m1 times T2 over T1 squared. 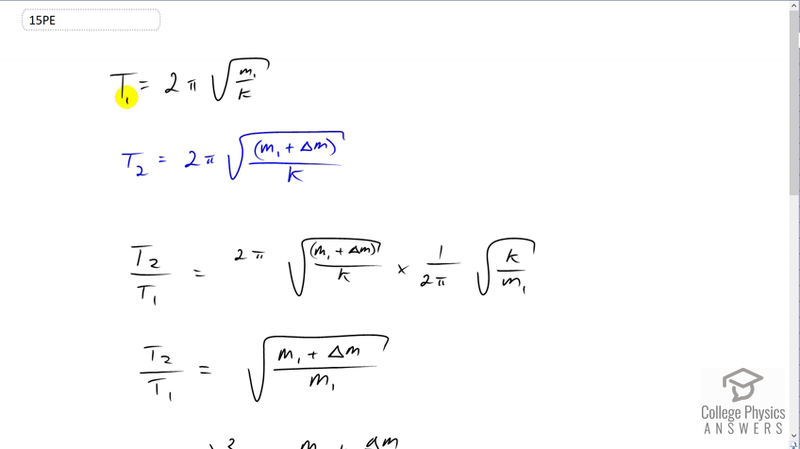 And then we subtract m1 from both sides to solve for delta m. So delta m which is the amount of mass that must be added to increase the period to two seconds is m1 times T2 over T1 squared minus m1. And then we could factor the m1 out, although we don't really have to but it's just it looks a little neater that way. Then, substituting in numbers, we have delta m that is 0.5 kilograms times two seconds which is the period after adding some mass divided by one and a half seconds. And that is squared and then minus one. And we get 0.38 kilograms as the amount of mass that must be added.